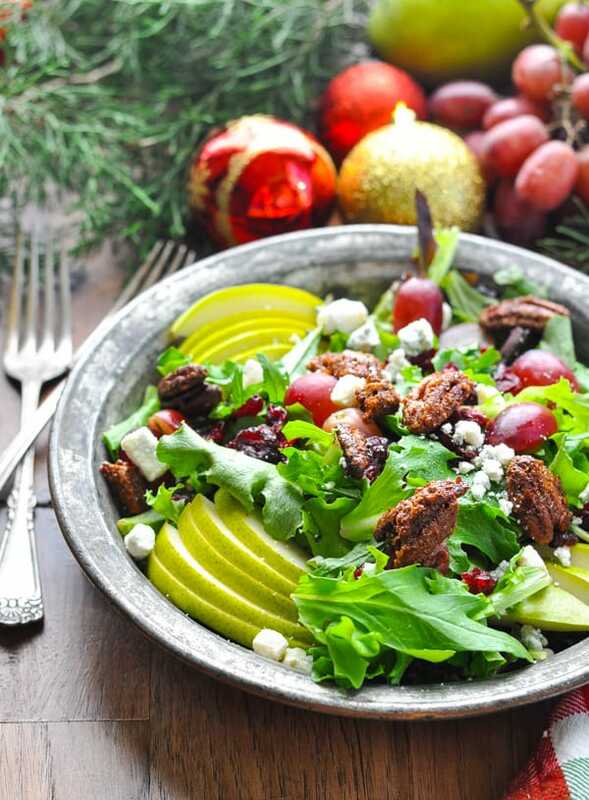 Full of beautiful flavors and textures from pomegranate, red grapes, candied pecans, pears, and cheese, this Christmas Salad with Champagne Vinaigrette is an easy, festive recipe for your holiday table! 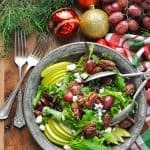 An easy Christmas green salad recipe just rounds out your holiday meal, and offers the perfect fresh touch to a table full of rich, decadent treats. 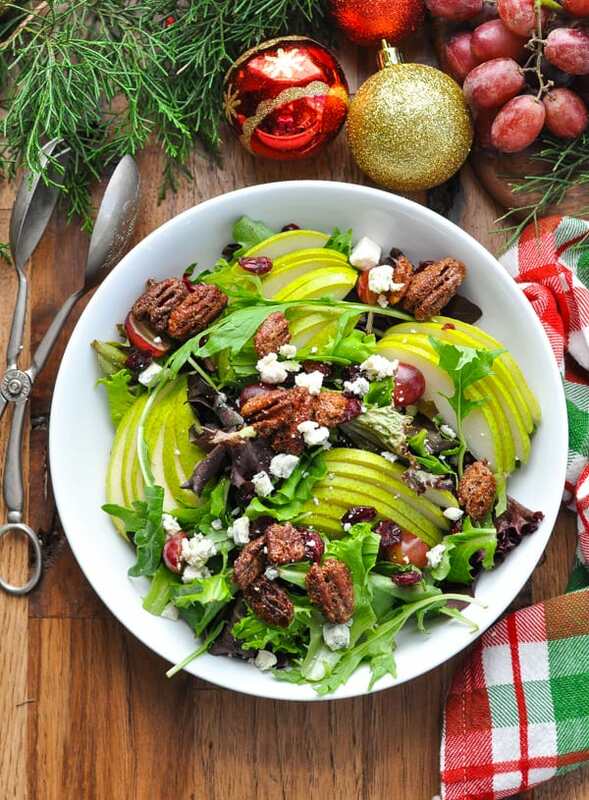 This green Christmas salad is full of delicious ingredients that taste fancy and special, but it’s simple to pull together in minutes! 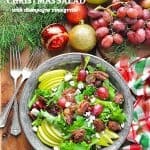 The homemade Champagne Vinaigrette adds the best sweet-and-tangy celebratory flavor to the seasonal dish, which works well for holiday parties, Christmas Eve dinner, Christmas dinner, or New Year’s Eve. Let’s start with the dressing! The Champagne Vinaigrette requires just a few basic pantry staples, which you can shake or whisk together in advance. If you can’t find champagne vinegar at your store, you can substitute with white wine vinegar or red wine vinegar. Quick tip: if you don’t want to bother with making your own homemade salad dressing, you can always take a shortcut and purchase a really good Champagne Vinaigrette at the grocery store (nobody needs to know)! This one’s a great option. Once you’ve got the dressing ready to go, it’s really just a matter of assembling the salad ingredients. 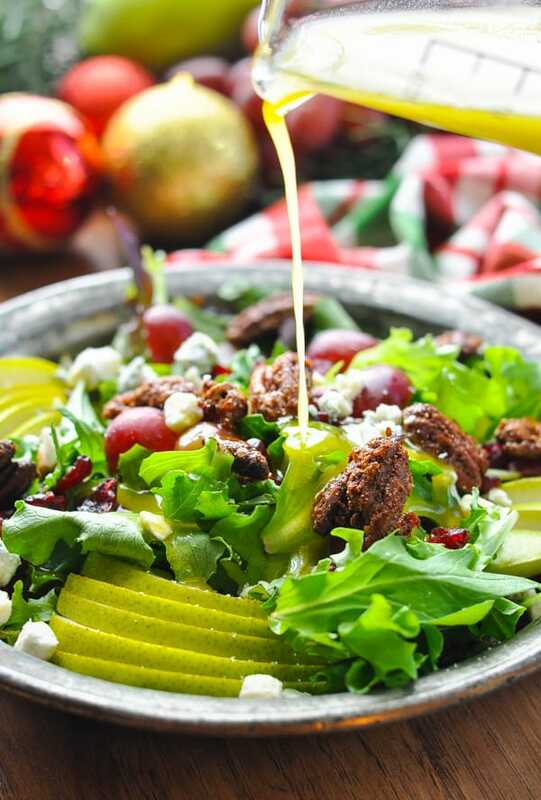 I love the sweet, spicy crunch of these easy Candied Pecans on top of the salad. Again, if you want a shortcut, feel free to purchase candied pecans at the grocery store! 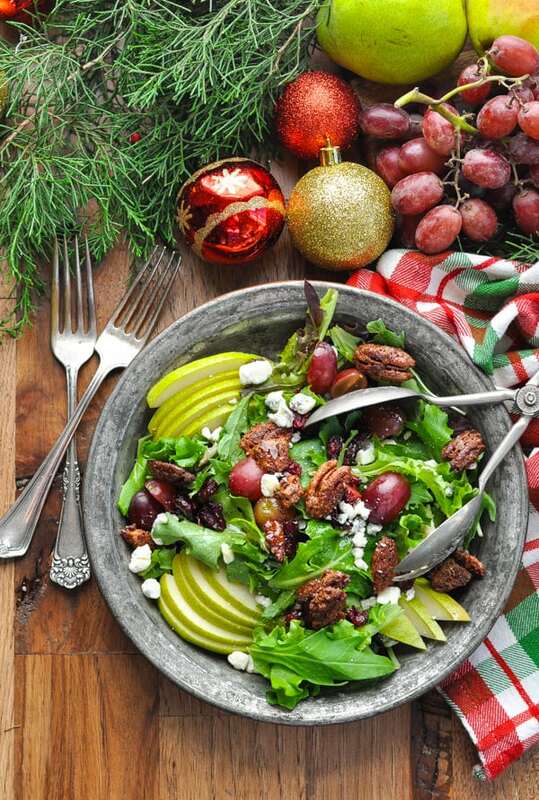 The rest of the salad ingredients include sliced pear (or apple, if you prefer), red grapes, fresh pomegranate seeds (if you can find them), lettuce, and blue cheese. The pomegranate seeds look like bright red jewels on the salad, but I often have trouble finding them in my local rural grocer, so I’ve substituted with dried cranberries here. They work nicely, too! Prepare the dressing in advance and store in the refrigerator for up to 1 week. 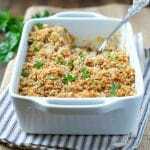 Allow the dressing to come to room temperature at least 30 minutes before serving, and whisk or shake at the last minute to combine. If you can’t find champagne vinegar, you can substitute with white wine vinegar or red wine vinegar. If you can’t find pomegranate seeds, dried cranberries are a great substitute! 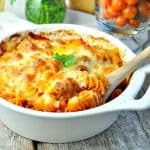 You can use feta cheese or goat cheese instead of the blue cheese, if you prefer. Wait to add the sliced pear (or apple) at the end (to prevent browning). Garnish with candied pecans just before serving so that the nuts don’t get soggy. Wait to dress with Champagne Vinaigrette just before serving. 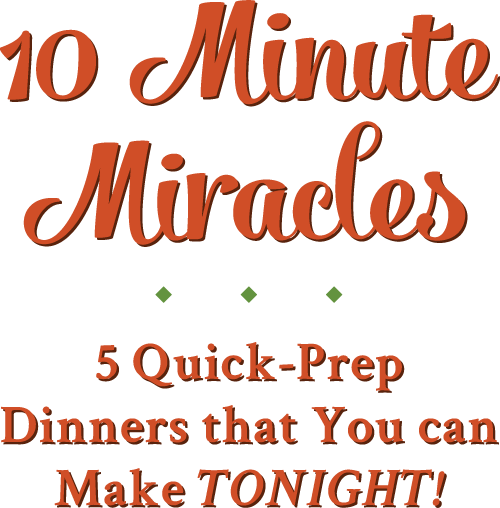 In a small bowl, whisk together sugar, Dijon, garlic, salt, pepper, and champagne vinegar. 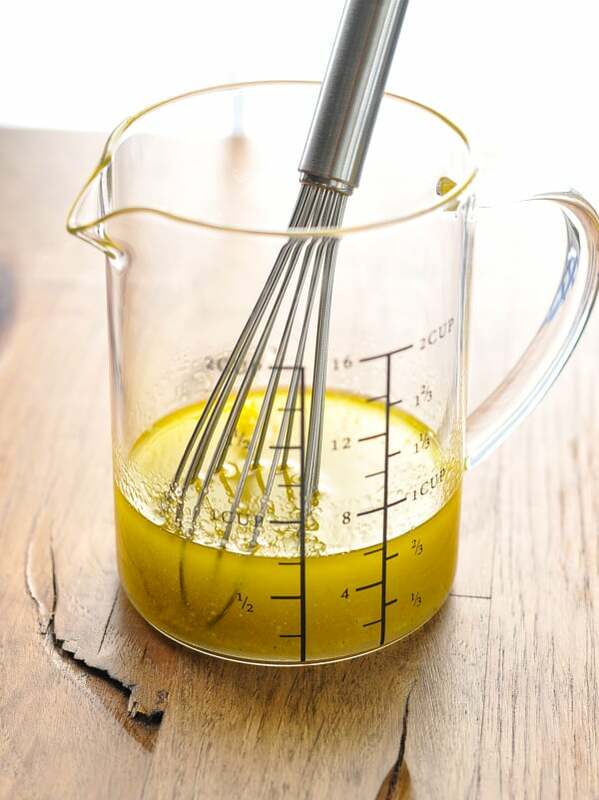 Continue whisking and slowly stir in olive oil until dressing emulsifies. 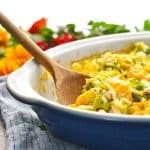 In a large bowl, toss together all ingredients. 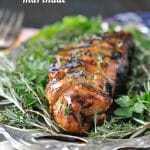 Drizzle with Champagne Vinaigrette, to taste. 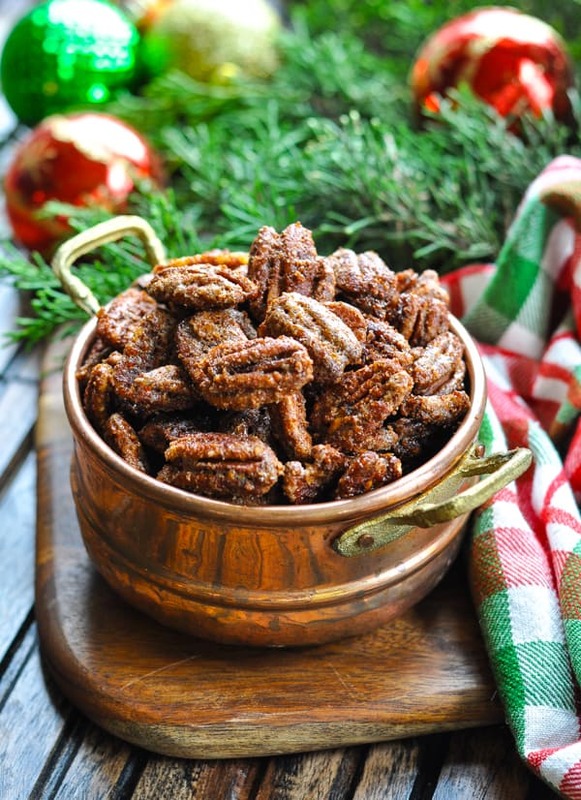 *You can purchase candied pecans, or you can make a batch of candied pecans using this easy 5-minute recipe. If you can't find champagne vinegar, you can substitute with white wine vinegar or red wine vinegar. If you can't find pomegranate seeds, dried cranberries are a great substitute! Garnish with candied pecans just before serving so that the nuts don't get soggy. This post was originally published in December, 2013. It was updated in December, 2018. 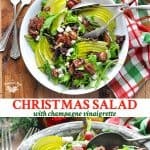 I’m not a big salad eater, typically because I don’t love dressing- but this looks like something I would love!